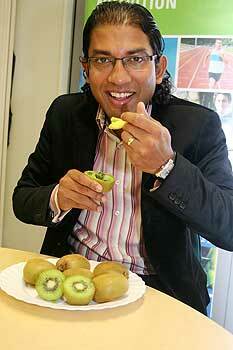 Ajmol Ali is taking part in a kiwifruit study. Sport and Exercise Science lecturer Dr Ajmol Ali did not suspect his cholesterol level was any cause for concern. Dr Ali is participating in a study called Men's Healthy Heart led by PhD nutrition researcher Cheryl Gammon, from the Institute of Food, Nutrition and Human Health. Up to 60 per cent of New Zealanders may have elevated cholesterol – a risk factor for heart disease, says Ms Gammon. The study aims to establish whether the simple act of eating two green kiwifruit a day, or extracts from green kiwifruit, as part of a normal, healthy diet will lower mildly raised cholesterol and help prevent heart disease. It is the first to look at the effects of soluble fibre from kiwifruit on lowering cholesterol absorption. Lowering blood cholesterol levels is often the first step towards a healthier heart. Nutrition surveys have shown that most New Zealanders do not consume sufficient fibre. "Other properties of kiwifruit may also contribute to heart health by lowering inflammation and blood clotting," Ms Gammon says. "Kiwis are world leaders in rates of heart attack, according to a recent study. Fifty per cent more New Zealanders die of heart attacks each year than in other developed nations." The Albany-based research team wants about 80 men with high cholesterol to take part in the 16-week study. Participants are required to eat two kiwifruit a day, and a low-fat dairy product containing soluble fibre extract from kiwifruit at different occasions during the study. Although women are not being included in this study because fluctuating female hormone levels can interfere with results, they too will benefit from study findings expected early next year, says Ms Gammon. For those who agree to take part, all the tests – and the kiwifruit – will be free. Further information can be obtained from: healthyhearts@massey.ac.nz or phone 09-414-0800 ext 41183.